UNFCCC meetings in Bonn this month. In 2018, pressure is rising for geoengineering to formally enter the UNFCCC negotiation process in some way or another. 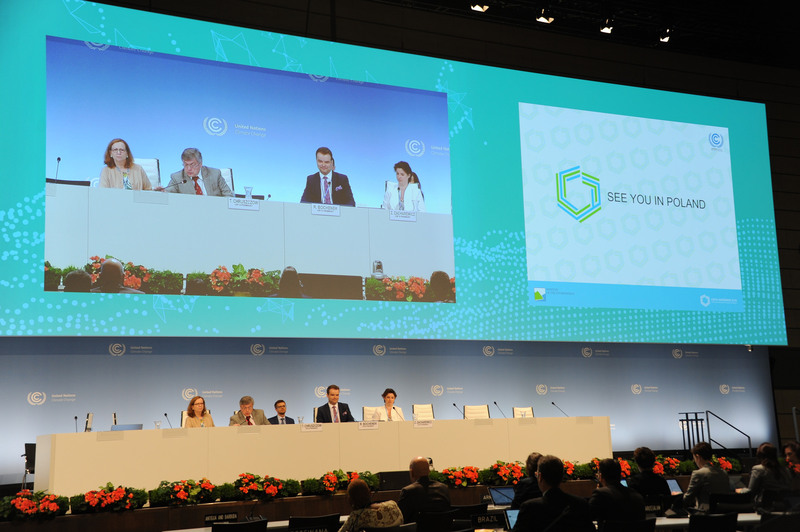 It has in recent years been a hot topic in the UNFCCC corridors, but it’s unclear if and how it will land in the official negotiation process. What is clear, however, is that bringing geoengineering into the mainstream of international climate policy carries a great risk of normalizing geoengineering as a legitimate response to climate change. In addition, C2G2, an international geoengineering governance initiative led by former climate diplomat Janos Pasztor, in their submission to the Talanoa Dialogue platform, call on the UNFCCC to take on the task of governing large-scale Carbon Dioxide Removal (CDR). Fortunately, many others pushed back, denouncing these high-risk technofixes and highlighting their risks (e.g. Climate, Land, Ambition and Rights Alliance (CLARA); European Academy of Science Advisory Council (EASAC) – as well as focussing on the need to drastically and equitably ramp up ambition and explore additional mitigation options (among others, Oil Change International, Stockholm Environment Institute, CSO Equity Report, and CARE International. Civil society will also have to keep a wary eye on the upcoming negotiations of the Global Stocktake – the ambition mechanism in the Paris Agreement that provides the basis for countries to periodically review progress and ratchet up ambition on mitigation, adaptation and finance. Some pro-geoengineering state and non-state actors might lobby for geoengineering to be incorporated into the Global Stocktake – allowing this to happen would lock the world into a trajectory on which these dangerous hacking-the-climate schemes become legitimized as “just another tool in the toolkit” in our global response to the climate crisis. More geoengineering developments and resistance against the mainstreaming of geoengineering in the UNFCCC are to be expected at the Bangkok session (August 2018) and COP24 in Katowice, Poland (December 2018) – The GeoengineeringMonitor team will keep you posted!